Where Best Friends Are Made...Just Kidding, that's Build-A-Bear. I'm glad you stopped by. Please feel free to comment or email me at paprbak99@aol.com . P.S. Check out "Blog" to find more fun stuff! I hope you enjoy this cheerful doll focused website. This site is in no way affiliated with american girl company,ourdolls.net, or anything else. It was created for the sole purpose to display creative ideas on dollplay. Click Below To Take A Poll! 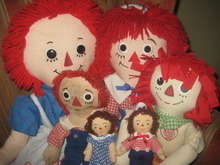 http://polldaddy.com/poll/6126136/">What What was your first doll/stuffy?